...Winco & Agriculture Solar-Diesel Hybrid Generators Increases Efficiency, Lowers Cost of Gas and Maintenance. Winco and Agriculture Solar hybrid generator sets for industrial or commercial applications. Today, Winco customers continue to benefit from their 75 years of generator experience. Across the board Winco and Agriculture Energies are incorporating new technology to provide the cleanest and most reliable power in the industry. The generators are built with pride and the primary mission is quality. Hybrid combo of Winco and Agriculture Solar generators is a permanently installed, fully automatic generator system that continuously monitors the incoming power supply. The system is designed to automatically furnish power to pre-selected circuits in your operation that supply your water. There’s no need for gasoline cans for refueling, or manual start pull ropes because Winco and Agriculture Solar packaged system supplies power automatically. 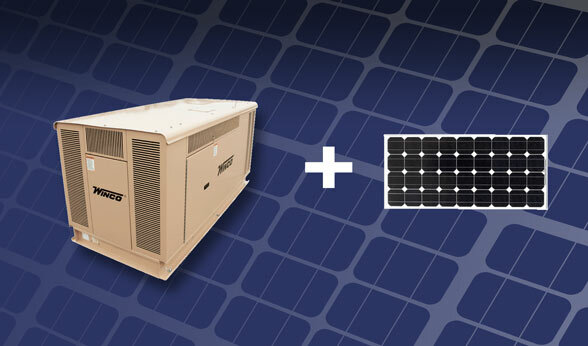 Powered by premium engines, Winco and Agriculture Solar 's packaged systems are perfect for power. Sound attenuated, weather protective enclosures are made using galvannealed steel with a finish for long life durability.The solid state control system operates the generator automatically when signalled by the automatic transfer switch mounted next to your incoming service panel. Standard features include: cycle crank and overcrank limiting, engine start delay and engine cool down timing, hour meters and chargers. At Agriculture Solar, Winco Hybrid Generator and Agriculture Energies can be your simple solution. • “Clean” electrical power for your valuable equipment.